Supereva: trendy, social & feeling good. An Italiaonline's brand. 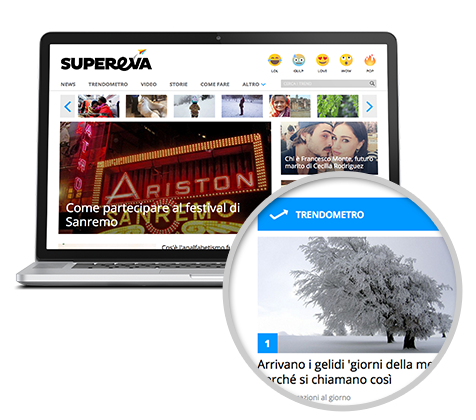 Supereva is the first Italian website whose topics are 100% chosen based on SEO and social network trends: fun facts, trivia and oddities, incredible discoveries and moving stories, all taken from the most shared and searched material on the web. A new form of infotainment, which on one hand lets you keep up with the web’s trending topics, and on the other offers a moment for relaxation with “feel good” content. What’s popular online, populates Supereva: this is precisely the portal’s strength. And it is based on the innovative data driven publishing strategy. Through an analysis of search engines and social networks conducted on the basis of algorithms that follow the trends of content’s growth, diffusion, sharing and searches, a dashboard constantly displays the hottest online topics at any given moment. Items are then drafted in crowdsourcing by editors who write on demand, on the basis of the results obtained and indications from the Supereva team. The website’s programming is therefore not set in advance by the editors, but modelled after public opinion: in fact, the most prominent articles are those which are most viewed, shared and commented. The website’s “trendometro” (trending meter) shows the ranking of the viral items of the moment in real time. A world of entertainment, fun facts and good humour. 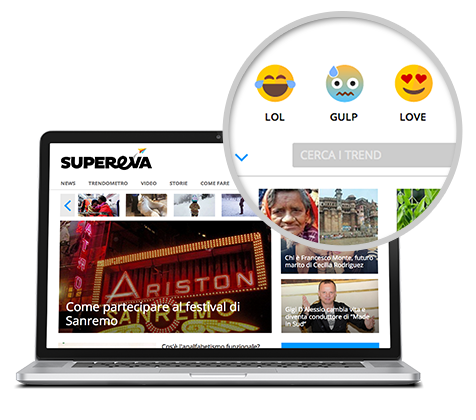 Feel good: Supereva wants its users to leave the website with a good mood. Because Supereva is happiness and fun, awe and wonder, sweet and strange. It’s for taking a break from the daily grind and enjoying yourself reading all the crazy and fun information circulating the Internet. Supereva hosts the incredible and fun news, viral videos, original tips, amazing facts and touching stories that can’t avoid arousing a reaction: after all, if it’s on Supereva, it’s precisely because it’s already making millions of people smile or surprising, interesting and exciting them.